It’s nearing the end of the year, and Star Wars fans have much to be grateful for. The latest trailer for The Last Jedi dropped last night, and tickets to the flick are now on sale for select parts of the US. 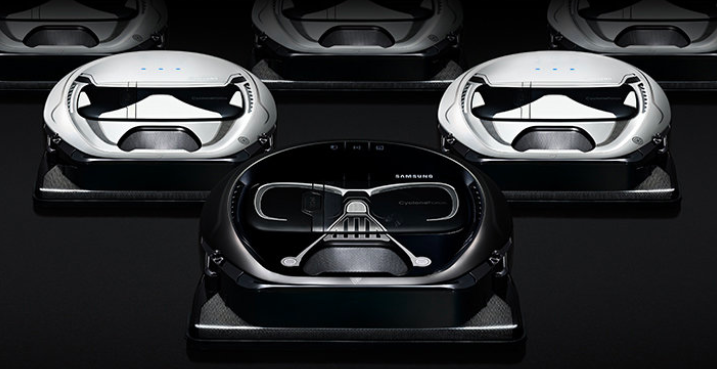 Samsung wants to get in on the sci-fi action, with the launch of a new Star Wars-themed version of its Powerbot vacuum cleaner that can apparently clean from “hardwood to Hoth,” the company quips. The bot, which comes in Darth Vader and Stormtrooper designs, uses nine smart sensors to map the shape of each room, and avoid obstacles like leg chairs while vacuuming. Users can also control the vacuum through a smart phone app, and use voice control with Amazon’s Alexa or Google Assistant. The vacuums also feature music and catch phrases specific to each design. For example, the Darth Vader vacuum makes the Sith Lord’s iconic breathing noises, while the Stormtrooper calls out “Let’s go!” when it begins cleaning. It’s quite nifty: imagine how great it would feel to boss your Darth Vader vacuum around like a little minion through your smartphone. If you’re terrible at cleaning, these little robots seem decent at their job. More importantly, you’ll be able to get rid of your wretched hive of scum and villainy. Both are available for preorder now for $799, with shipments due out the week of November 5th. Previous The Tamagotchi is back, but does it need to be?